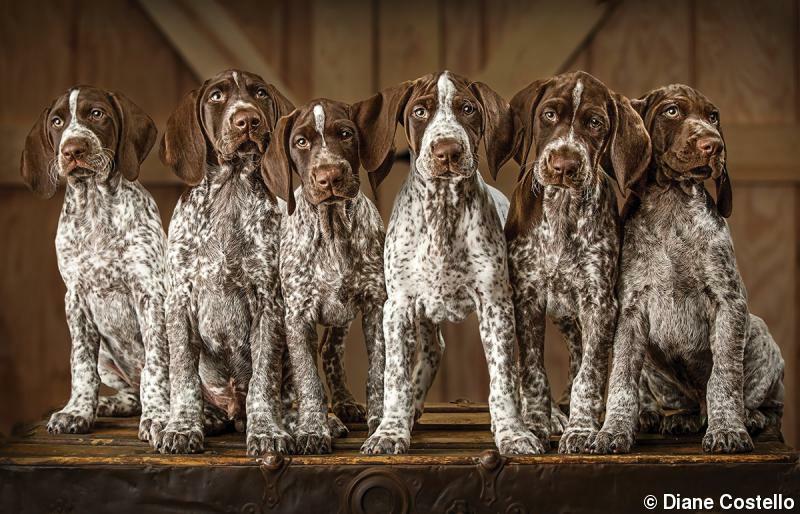 Diane Costello, M.Photog.Cr., CPP, captured “Follow My Lead” when a local breeder asked her to make portraits of six German shorthaired pointer puppies with their canine mom and the breeder’s two daughters. “She wanted to get a portrait of all six puppies before they headed out to their new homes,” says Costello. After making individual portraits, she attempted one with all of them together. “It took two adults, one on each side, and the owners’ two daughters, who hid behind the trunk, to get all the puppies to stand still for one split second,” says Costello. “At eight weeks old, they were all over the place. It was crazy fun.” Fog Dog Studios is based in Half Moon Bay, California, and specializes in pet portraiture. POST-CAPTURE: She used Adobe Lightroom for cataloging and initial editing and Adobe Photoshop for the final.